Toyin, wife of the President of the Senate, Bukola Saraki, has been named as special adviser to the Independent Advisory Group (IAG) of the World Health Organisation's (WHO) Regional Office for Africa (AFRO). The Media Office of Toyin Ojora-Saraki, in a statement in Abuja on Monday, said the appointment was made earlier this month by WHO's Regional Director for Africa, Matshidiso Moeti. "This move is intended to bring Mrs. Saraki's considerable frontline experience to bear on WHO's strategy and policy." Mrs. Ojora-Saraki has since accepted the appointment based on the Advisory Group's focus on women and children's health and in view of her role as a global champion for Universal Healthcare Coverage (UHC). "I welcome the Advisory Group meeting's focus on the health of women, children and adolescents as flagship indicators for Universal Healthcare Coverage (UHC) progress. "As a global champion for UHC, I advocate for a fuller understanding of its benefits, which go beyond health outcomes and include improved gender equality, higher levels of preparedness for epidemic outbreaks and transformative economic effects. "As Global Goodwill Ambassador for the International Confederation of Midwives, I particularly welcome the introduction of WHO AFRO's focused curriculum for the professional qualification education of Midwives and Nurses in Africa," she said. "I am looking forward to hitting the ground running in my new role as special adviser at the Independent Advisory Group meeting this week in Johannesburg. 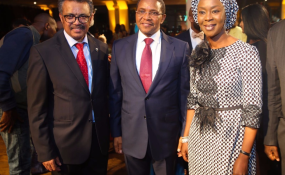 "The experience I have gained as Founder-President of the Wellbeing Foundation Africa, working closely with our midwives on the frontline, as part of the global Every Woman, Every Child Strategy to end all preventable maternal, newborn and child deaths, including stillbirths, by 2030, will inform my advice to the WHO," she added.